A couple of weeks after its formal announcement, the iPad (2018) is now available for pre-orders in India, at least, on one e-commerce site. The new iPad was launched with a starting price of Rs. 28,000 and was expected to hit stores in the country sometime in April. But ahead of its official availability through Apple Authorised Resellers, Flipkart has opened the pre-order window for the iPad (2018) in Silver, Gold, and Space Gray colour options. Flipkart says the tablets release on April 20, going up to April 25 depending on the connectivity or colour variants. 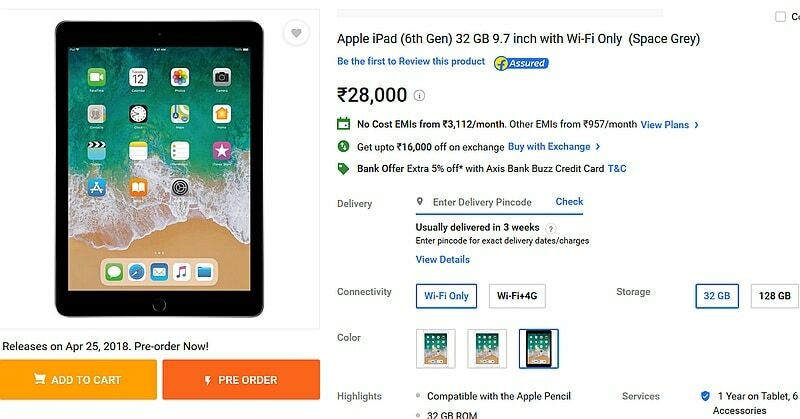 Flipkart has listed the iPad (2018) Wi-Fi and Wi-Fi + Cellular models in both 32GB and 128GB storage options. The 32GB iPad (2018) Wi-Fi model has been listed at Rs. 28,000, while the 32GB iPad (2018) Wi-Fi + Cellular is priced at Rs. 35,700. 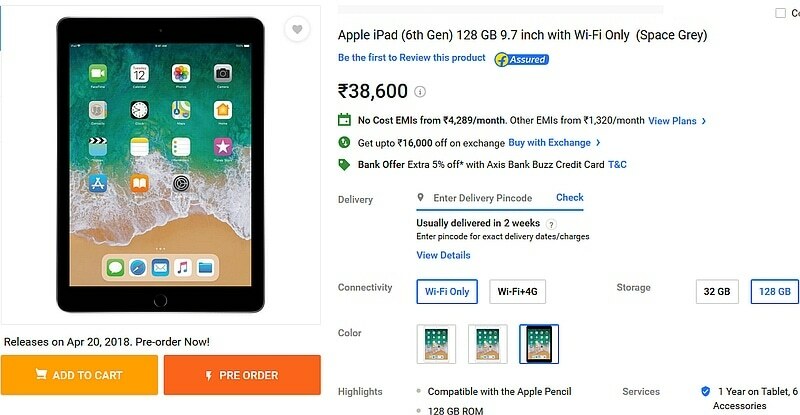 Similarly, the 128GB iPad (2018) Wi-Fi model is available on Flipkart at Rs. 38,600 and the 128GB iPad (2018) Wi-Fi + Cellular model at Rs. 46,300. There is also an exchange offer to give up to Rs. 16,000 in lieu of an old device. Furthermore, customers can avail an instant discount of Rs. 200 on purchasing via Axis Bank Buzz Credit Card. Specifications-wise, the iPad (2018) is quite similar to the iPad (2017). However, its 9.7-inch Retina (2048x1536 pixels) IPS display now supports the Apple Pencil stylus. There is also the Apple A10 Fusion SoC, which is a significant upgrade over the Apple A9 SoC that powered last year's iPad. The iPad (2018) sports an 8-megapixel rear camera with an f/2.4 aperture and a 1.2-megapixel FaceTime HD camera on the front with an f/2.2 aperture. In terms of connectivity, you'll get 4G LTE and A-GPS (on the Wi-Fi + Cellular model), as well as Wi-Fi 802.11ac, Bluetooth v4.2, and a Lightning port. The device also has a Touch ID fingerprint sensor and includes an accelerometer, ambient light sensor, barometer, digital compass, and a three-axis gyroscope. Apple has also provided the new versions of iWork and a Smart Annotation feature that is a part of the Pages app. Likewise, the company launched the new versions of GarageBand and Clips alongside the iPad (2018) that are specifically designed for kids.